Analysis: Gillislee was released by the Patriots on Sept. 1 and cut by the Saints about five weeks later, finishing 2018 with 16 carries for 43 yards in four games. The 28-year-old would make sense as a potential short-yardage back in Detroit, where LeGarrette Blount presumably will be allowed to walk after turning in an ugly 2018 campaign (2.8 yards per carry). Given their various needs on defense, the Lions likely hope to go cheap behind Kerryon Johnson in the backfield. 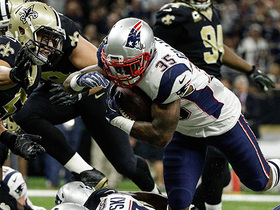 Analysis: A reunion makes a lot of sense after the Saints released Gillislee on Saturday. The Patriots have been carrying just two running backs on the 53-man roster, potentially creating a dangerous situation if Sony Michel or James White were to suffer an in-game injury. Gillislee probably wouldn't be a huge threat with all three healthy, but he might take away a few of Michel's carries. 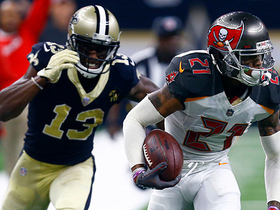 Analysis: With running back Mark Ingram suspended for the first four games of the year, Gillislee was signed in early September to help take some of the pressure off of second-year back Alvin Kamara. Ultimately, the veteran's performance was uninspiring, as he compiled only 16 carries for 43 yards in his four appearances. His roster spot will now be used to activate Ingram off the suspended list. Analysis: It was another underwhelming performance for Gillislee, who played just five snaps. With the Saints on bye in Week 6 and Mark Ingram set to return in Week 5, Gillislee probably does not need to be rostered in most formats. Analysis: Gillislee played just nine offensive snaps compared to 51 snaps for starter Alvin Kamara. While Gillislee should continue to see a handful of weekly touches while Mark Ingram remains suspended, he's totaled a mere 27 yards in his first two games. With such meager production, Gillislee should not be anywhere near most starting lineups and can probably be cut or left on waivers in many fantasy leagues with Ingram expected to return Week 5. Gillislee gained nine yards on three carries and lost a fumble in Sunday's loss to the Buccaneers. Gillislee may get some competition in the backfield before Sunday's game against Tampa Bay, Mike Triplett of ESPN.com reports. Analysis: With Gillislee and Alvin Kamara left as the only running backs on the 53-man roster, there's been some speculation about the former Patriot handling a sizable chunk of the rushing workload Week 1. It's still a possibility, but there's also some chance the Saints promote Boston Scott or Jonathan Williams from the practice squad before Sunday to serve as the No. 2 back against Tampa Bay. Gillislee is listed behind Alvin Kamara on the Saints' current running back depth chart, Nick Underhill of The New Orleans Advocate reports. Analysis: With Mark Ingram (who scored 12 TDs in 2017) set to miss the first four games of the season, Kamara is clearly the team's lead back. Gillislee's quick rise up the depth chart since signing with the team Sunday suggests he could carve out a role in Ingram's absence, notably in short-yardage situations. Meanwhile, the 5-foot-6, 203-pound Boston Scott is on hand to provide a change-of-pace option and can potentially contribute as a returner. Gillislee was signed by the Saints on a one-year deal Sunday, NFL Network's Ian Rapoport reports. Analysis: Gillislee's visit with the Saints concluded with the signing of a one-year contract for the former Patriot, who had just been released by New England on Saturday. He'll likely be a candidate for touches primarily in short-yardage situations as a complement to starter Alvin Kamara and Boston Scott while Mark Ingram (suspension) misses the first four weeks of the regular season. Gillislee is visiting the Saints on Sunday, Ian Rapoport of NFL Network reports. Analysis: Gilislee lost out to Jeremy Hill in New England but may quickly land on his feet with a New Orleans team that ended cutdown day carrying just two healthy, non-suspended RBs on its 53-man roster. The 27-year-old would provide a power element alongside Alvin Kamara and Boston Scott while Mark Ingram is suspended for the first four weeks of the season. The Patriots released Gillislee on Saturday, Kevin Duffy of MassLive.com reports. Analysis: Gillislee was outplayed by Jeremy Hill this preseason, finishing with 33 carries for 100 yards and a touchdown. This probably wasn't a difficult decision for the Patriots, considering Gillislee was also the more expensive option of the two. There is a decent chance Gillislee finds another landing spot at some point this season. Gillislee rushed 10 times for 35 yards and a touchdown during Friday's 25-14 loss to the Panthers in the third preseason game. Gillislee rushed for 22 yards on nine carries during Thursday's 37-20 win over the Eagles. Gillislee took 14 carries for 43 yards in Thursday's 26-17 preseason win over Washington. Gillislee (undisclosed) ditched his red (no contact) jersey at practice Friday, NESN.com reports. Analysis: Per the report, Gillislee appeared to be a full practice participant Friday, which paves the way for him to make a case for a roster spot. With Sony Michel, Rex Burkhead and James White viewed as locks to make the team, Gillislee is competing with Jeremy Hill, Brandon Bolden and undrafted free agent Ralph Webb for depth chart slotting in the Patriots' backfield. Gillislee (undisclosed) returned to practice Thursday, the Boston Herald reports. Analysis: Gillislee, who had missed three practices, sported a red non-contact jersey, but he hopes to be cleared for full contact by Friday. The 27-year-old is currently fighting for a roster spot, while competing against Brandon Bolden, Jeremy Hill and undrafted free agent Ralph Webb behind roster locks Sony Michel, Rex Burkhead and James White. Gillislee missed Sunday's practice session for undisclosed reasons, Kevin Duffy of MassLive.com reports. Analysis: It's unclear if Gillislee is suffering from an injury or if he was given the day off for another reason. The team hasn't expressed concern about his availability to this point, and the veteran back is expected to return to the field in the coming days. Gillislee "did not appear to be as quick or fluid" as most of the Patriots' other running backs during positional work in the team's current voluntary OTAs, Paul Perillo of the team's official site reports. Following the Patriots' first-round selection of running back Sony Michel, Gillislee, Jeremy Hill and Brandon Bolden could end up fighting for one roster spot, WEEI.com reports. Analysis: With Michel, Rex Burkhead and James White locks to make the team, it stands to reason that Gillislee, Hill and Bolden will jostle for depth slotting in the New England backfield. Bolden brings special-teams utility to the table and Hill was a free-agent acquisition, so reading the tea leaves, it could take an injury or two for Gillislee to stick around in the wake of a 2017 season in which he was a healthy scratch for much of the second half of the campaign. Free-agent addition Jeremy Hill is expected to challenge Gillislee for the Patriots' power-back role, Mike Reiss of ESPN.com reports. Gillislee may be a cap casualty for the Patriots during the offseason, Jake Levin of NBC 10 Boston reports. Gillislee finished the 2017 season with 104 carries for 383 yards and five TDs to go along with one catch for 15 yards in nine games. Gillislee (coach's decision) is inactive for Sunday's Super Bowl against the Eagles. Analysis: Gillislee avoided the injury report this week, suggesting the knee injury that's plagued him in the second half of the season was behind him. After calling himself a game-time decision for this game Wednesday, the relative health of the Patriots backfield likely made head coach Bill Belichick's decision an easy one. With Gillislee on the sideline again, the Patriots will rely on Dion Lewis, James White and Rex Burkhead to man the running back position. Gillislee (knee) does not carry an injury designation for Super Bowl LII. Analysis: Gillislee is thus slated to be available for Sunday's game against the Eagles, though with Dion Lewis, James White and Rex Burkhead also in the Patriots' backfield mix, it's possible that Gillislee could be made inactive for the contest in the event that the team chooses not to suit up four running backs. Though not listed on the Patriots' injury report after practicing fully Wednesday, Gillislee (knee) calls himself a game-time decision for Super Bowl LII, WEEI.com reports. 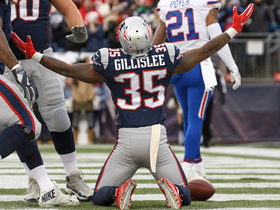 "As far as health-wise, I am almost there," Gillislee noted Wednesday. "I am not where I want to be. I have battled a couple of injuries this year, but I was able to be healthy this week enough to practice. That has been great." Analysis: Given his current level of practice participation, Gillislee is clearly trending in the right direction in terms of his potential availability for Sunday's game against the Eagles. That said, Gillislee is not a lock to suit up for the contest even if he is physically capable of doing so, with Dion Lewis, James White and Rex Burkhead also in the Patriots' backfield mix. Gillislee (knee) wasn't listed on the Patriots' injury report Wednesday. Gillislee (knee) was listed as a limited participant on Wednesday's posted practice estimation. Analysis: While Gillislee's knee was not sufficiently recovered to play in the AFC championship game this past Sunday, we suspect that he'll be available for the Super Bowl against the Eagles on Feb. 4. That said, in such a scenario, he's not a lock to be active, and if he is, he'd work behind Dion Lewis, while adding depth to a running back rotation that would also include Rex Burkhead and James White. Gillislee (knee) is inactive for Sunday's AFC championship game against the Jaguars. Analysis: Sidelined for a third consecutive game due to a sprained knee, Gillislee will yield the backfield to Dion Lewis, James White and Rex Burkhead (knee), any of whom are viable candidates to strike against a Jacksonville defense that allowed 136.2 scrimmage yards per game to running backs during the regular season. Gillislee (knee) isn't expected to play in Sunday's AFC championship game against the Jaguars, ESPN.com reports. Analysis: Per the report, Gillislee's knee has "not sufficiently recovered" at this stage. On the plus side for the Patriots, fellow running back Rex Burkhead (knee) is slated to be available Sunday and is on track to work in a rotation with lead back Dion Lewis and change-of-pace option James White. Gillislee (knee) is listed as questionable for Sunday's AFC championship game after practicing in a limited fashion this week. Analysis: Gillislee -- who is bouncing back from a sprained knee ligament -- may have progressed enough to be available Sunday, though he isn't a lock to play in such a scenario, with Dion Lewis and James White ahead of him on the depth chart and Rex Burkhead (knee) a candidate to return to the Patriots' backfield mix this weekend. Gillislee (knee) was limited at Wednesday's practice. 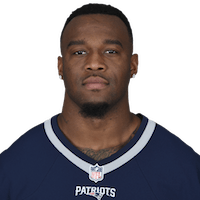 Analysis: Per ESPN's Mike Reiss, Gillislee, who last suited up on Dec. 24, is bouncing back from a sprained ligament in his knee. Gillislee isn't a lock to play in Sunday's AFC championship game against the Jaguars even if he is healthy enough to do so, with Dion Lewis, James White and Rex Burkhead (knee) -- health permitting -- also in the team's backfield mix. Gillislee (knee) is listed as inactive Saturday versus the Titans. Analysis: A regular scratch for most of the second half of the season, Gillislee wasn't deemed healthy enough to provide support out of the backfield in the Pats' postseason opener. Because Rex Burkhead (knee) is also out of the lineup, Dion Lewis and James White (ankle) will take on almost all the running back responsibilities. Gillislee (knee) is not expected to participate in Saturday's showdown against the Titans, Adam Schefter of ESPN reports. Analysis: Gillislee returned to practice Thursday in limited fashion, but it appears as though he has not recovered enough to suit up Saturday. With Rex Burkhead (knee) also expected to sit this one out, look for Dion Lewis and James White to take on the majority of the work out of the backfield. Final confirmation on Gillislee's status will be announced once the Patriots release their inactives closer to kickoff. Gillislee (knee) is listed as questionable for Saturday's playoff game against the Titans after returning to practice in a limited fashion Thursday. Analysis: Given that this marked Gillislee's first practice since he was injured in Week 16, he's no lock to be made active for Saturday's contest. Moreover, even if Gillislee is available, he could still be deemed a healthy scratch as he was for a six-game stretch, when the team's other running backs were healthy, per the Boston Herald. Gillislee (knee) was spotted at Thursday's practice, Mike Reiss of ESPN.com reports. Analysis: We'd expect that Gillislee will be listed as a limited participant Thursday, but his return to the field could foreshadow the running back being listed as questionable for Saturday's playoff game against the Titans. In such a scenario, however, Gillislee wouldn't be a lock to be made active for the contest, assuming Rex Burkhead (knee) and James White (ankle) are healthy enough to suit up this weekend. Gillislee (knee) remained sidelined at Wednesday's practice, Jeff Howe of the Boston Herald reports. Analysis: Gillislee hasn't practiced since suffering the knee injury in Week 16, with his back-to-back absences Tuesday and Wednesday clouding his availability for Saturday's divisional-round game against the Titans. In any case, Dion Lewis is in line to head the Patriots backfield this weekend, but who will be available to support him in complementary roles remains up in the air. In addition to Gillislee, Rex Burkhead (knee) and James White (ankle) are working in limited fashion at practices this week. Gillislee (knee) didn't practice Tuesday. Analysis: Gillislee's last known activity occurred Week 16, when both Rex Burkhead (knee) and James White (ankle) were sidelined. The latter pair returned in a limited capacity Tuesday, setting themselves up to serve as change-of-pace options for starter Dion Lewis in Saturday's divisional-round game against the Titans. If Burkhead and/or White are available, Gillislee likely would be one of the Pats' inactives this weekend. Gillislee (knee) did not take part in Thursday's practice, Jeff Howe of the Boston Herald reports. Analysis: Gillislee has not practiced since Week 16, but he won't be at risk of missing any games this week with the Patriots on bye in the wild-card round. Gillislee (knee) wasn't present for the media-access portion of Wednesday's practice, Jeff Howe of the Boston Herald reports. Gillislee (knee) has been ruled out for Sunday's game against the Jets, Mike Reiss of ESPN.com reports. Analysis: The same applies to Rex Burkhead (knee), so look for Dion Lewis to lead the Patriots' Week 17 backfield, with James White (ankle) likely to return to action Sunday in his usual change-of-pace role. Meanwhile, versatile special-teams ace Brandon Bolden will be on hand in a reserve role. Gillislee (knee) did not take part in Friday's practice, Zack Cox of NESN.com reports. Analysis: Gillislee found paydirt last week in his first action in nearly two months, but he has not practiced this week due to his injury, so it's looking unlikely he will get a chance to back up that performance. Gillislee's official status for Week 17 will be revealed after Friday's practice comes to an end. Gillislee (knee) remained sidelined at Thursday's practice, Jeff Howe of the Boston Herald reports. Gillislee missed practice Wednesday with a knee issue, Mike Reiss of ESPN.com reports. Analysis: We'll have to see if Gillislee's absence from practice Wednesday was maintenance-related, or something that could impact his Week 17 status. If Gillislee is available Sunday against the Jets, it's not hard to imagine him remaining involved in the Patriots' ground game behind Dion Lewis, given that Rex Burkhead (knee) looks iffy, at best, for the contest and James White (ankle) is also banged up. Gillislee (undisclosed) wasn't spotted at practice Wednesday, Jeff Howe of the Boston Herald reports. Analysis: Per the report, Gillislee's knee was wrapped in ice following Sunday's win over the Bills, so it looks as though he could be managing that issue. Also absent from practice Wednesday was fellow running back Rex Burkhead (knee), who Gilleslee helped replace against Buffalo. Dressing for the first time in seven games, Gillislee finished that contest with six carries for 28 yards and a touchdown and gained 15 yards on his lone reception. Gillislee carried six times for 28 yards and a TD and caught one pass for 15 yards in Sunday's 37-16 win over the Bills. Analysis: Gillislee did just enough to modestly help those who rolled with him in Week 16, hoping he'd hit pay dirt in his return to the Patriots' backfield mix after a string of lineup scratches. Meanwhile, Dion Lewis exploded for 129 rushing yards on 24 carries, while catching five passes for 24 yards and scoring two TDs. How much work Gillislee sees in Week 17 hinges on what the Patriots are playing for, as well as the health of fellow running backs Rex Burkhead (knee) and James White (ankle). Gillislee is active for Sunday's game against the Bills. Analysis: With both Rex Burkhead (knee) and James White (ankle) out this week, Gillislee -- who was last active Oct. 29 -- is in line to work in tandem with Dion Lewis, who has emerged as the Patriots' lead back of late. It was presumably Gillislee's nose for the end zone that prompted the Patriots to sign the running back away from Buffalo, and it's not hard to imagine him seeing some goal-line opportunities in his return to the mix in Week 16, against his former team. With Rex Burkhead (knee) out Sunday against the Bills, Gillislee is on track to re-enter the Patriots' backfield mix in Week 16, ESPN's Mike Reiss reports. Gillislee is expected to rejoin the Patriots' game-day roster Sunday against the Bills with Rex Burkhead (knee) unlikely to be available until the postseason, Mike Reiss of ESPN.com reports. Gillislee is inactive for Sunday's game against the Steelers. Analysis: Gillislee has now been scratched for six straight games. Meanwhile, Dion Lewis, Rex Burkhead and James White will head the Patriots' Week 15 backfield, with core special-teamer Brandon Bolden in reserve. Gillislee is not listed on the Patriots' Week 15 injury report. Analysis: Gillislee -- who was under the weather heading into Monday's loss to the Dolphins -- has been inactive five straight games, as he's the odd man out behind Dion Lewis, Rex Burkhead and James White. Gillislee's power running skills may needed by the Patriots down the stretch, but for now, he's clearly off the fantasy lineup radar. Gillislee (illness) is inactive for Monday night's game against the Dolphins. Analysis: With Gillislee inactive for the fifth straight game, Dion Lewis, Rex Burkhead and James White will head the Patriots' Week 14 backfield. Future game plans may lead to Gillislee's power running skills being needed down the stretch, but he's the odd man out for now. Gillislee is listed as questionable for Monday's game against the Dolphins with an illness, Doug Kyed of NESN.com reports. Analysis: Gillislee was a new addition to the injury report and was unable to practice Saturday. The 27-year-old has been a healthy scratch each of the last four weeks, and currently remains the odd man out in the New England backfield regardless of if he is healthy enough to play Monday. Gillislee is inactive for Sunday's game against the Bills. Analysis: Injuries or future game plans may call for Gillislee's power running skills to be needed down the road, but for now at least, he's the odd man out, with Dion Lewis, Rex Burkhead and James White set to head the Patriots' Week 13 backfield. Gillislee is inactive for Sunday's game against the Dolphins. Analysis: As a result, Dion Lewis, Rex Burkhead and James White will head the Patriots' Week 12 backfield, with fellow RB Brandon Bolden also on hand, but in line to work primarily on special teams. Injuries or future game plans may lead to Gillislee's power running skills being needed again, but for now, his lack of utility in the passing game makes him the odd man out among the team's running backs. Gillislee is inactive for Sunday's game against the Raiders. Analysis: Gillislee will be a healthy scratch for the second consecutive week, which sets the stage for Dion Lewis, Rex Burkhead and James White to head the Patriots' backfield Sunday. Future game plans may lead to Gillislee's power running skills being needed in subsequent weeks, but for now at least, he's the odd man out. Gillislee is inactive for Sunday's game in Denver, Ben Volin of The Boston Globe reports. 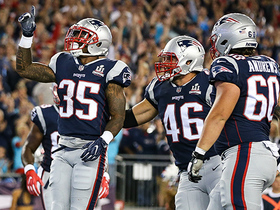 New England Patriots running back Mike Gillislee runs in 1-yard TD. 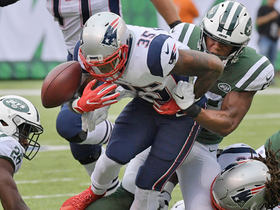 The New York Jets recover a fumble by New England Patriots running back Mike Gillislee. New England Patriots running back Mike Gillislee fights off defenders for a seven-yard gain. 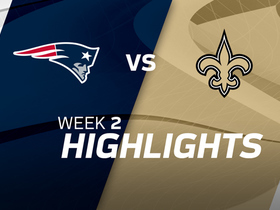 Check out some of the best plays from the New England Patriots matchup against the New Orleans Saints in Week 2. 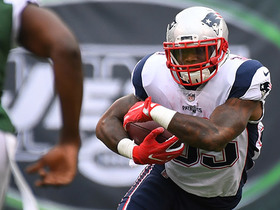 New England Patriots running back Mike Gillislee powers in a 2-yard TD. 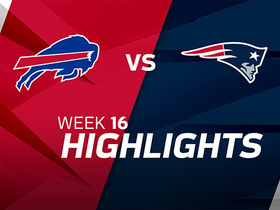 Watch New England Patriots running back Mike Gillislee's best plays in his Week 1 match up against the Kansas City Chiefs. 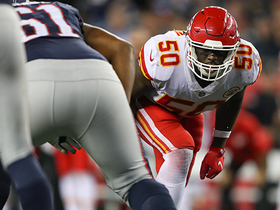 Watch the Kansas City Chiefs defense hold their ground against the New England Patriots on a key 4th-and-inches.